It was 2003 and I was a senior in high school when I first saw the newly published The Tale of Despereaux on a bookstore shelf. I remembered a quote from my high school English/Theatre/Creative Writing teacher: “‘Don’t judge a book by its cover.’ Bull$#!&! Judge it!” And I did. I looked at the illustration of Despereaux on the cover, running, a needle tied around his waist with red thread. I wondered why he didn’t seem to have a tail. I felt his urgency. I knew there was this something this mouse needed to communicate to me. I knew he needed to tell me his story. I didn’t do my usual trick of reading the first sentence of the book, or even the subtitle, which was: “Being the Story of a Mouse, a Princess, Some Soup and a Spool of Thread.” (Had I done so, my intuition would have been confirmed.) Instead, I picked up the book knowing nothing more about it than a feeling, bought it, and devoured it. I was in love. I had expected a good story; I had not expected to read my soul in book form. I told everyone about it. I raved about it to my classmates. I described it as a work of art disguised as a children’s book. Then a friend told me that she had gone to the bookstore and asked for it, and the sales clerk told her they were packing the books up to ship them back because they weren’t selling. I had to do something! But before I could organize a grassroots protest to buy and distribute every copy and promote it far and wide, I went to my local bookstore and there was Despereaux, bearing his shiny, new, golden Newberry Medal. And I knew he was safe. I read Kate’s other novels for children. No one, I concluded, so perfectly articulates sadness and beauty of the world—sadness and beauty, both at the same time, in conversation with each other. And she does this in children’s books, a vastly underestimated medium. Because of Winn Dixie, The Miraculous Journey of Edward Tulane, The Magician’s Elephant—all gems, but none as dear to my heart as Despereaux. Fast-forward to a couple of years ago when I started following her on Facebook and discovered that her magnificent brain works very much like my own when it comes to seeing the miraculous in the mundane, writing it down, trusting intuition, and letting stories develop the way they need to. Me: They say that all aspiring writers sometimes think, “I’m terrible at this, I’m a fraud, there are so many better writers than me, no one is ever going to publish or read this stuff, I should get a sensible career,” (etc). I know I sometimes think this way. Did you experience this when you were starting out, and if so, how did you work through it? 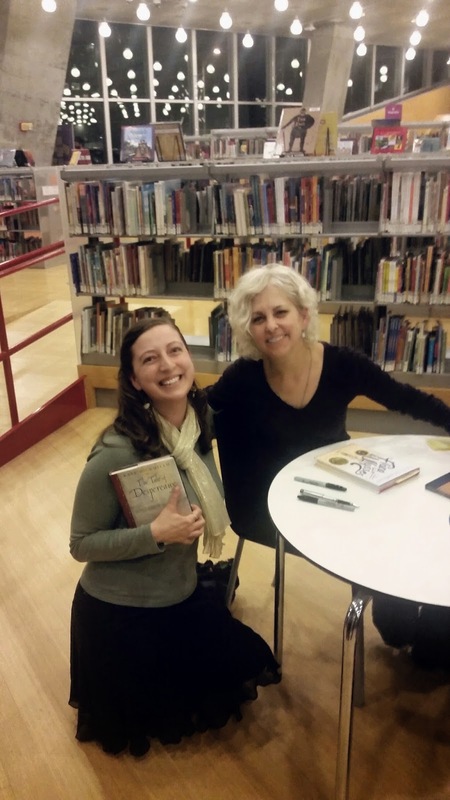 Kate DiCamillo: Oh, Beth. I experienced that when I was starting out. Yes. And I experience it every day still. I doubt myself. I do the work anyway. When I learned last month that she would be visiting the Seattle Central Library on February 25th, I knew I had to be there. I tried to keep breathing on the ride up to Seattle, but I could feel my anxiety—my old nemesis—roiling beneath the surface. My pulse pounded and my throat tightened. When we sat down in the auditorium, I held my boyfriend’s hand and didn’t want to let go. Then I looked around and smiled. We must have been the only two childless adults in the audience. When she walked in, I felt (to my great surprise and relief) more relaxed instead of more anxious. She was wearing well-worn jeans and a purple shirt, which is my standard outfit on most days. (*checks* Yup, it’s what I’m wearing today.) She was short. Her voice was deeper than I expected. She told wonderful, funny anecdotes about her life and how she gets her story ideas. She talked about being painfully shy as a kid. She was so beautifully human that I wasn’t scared anymore. Until I stood in line to get her autograph. I clutched my boyfriend’s hand again, trying to remember the nice, thoughtful, not-crazy things that my sister had told me to say (I’ve previously babbled ridiculous things when meeting my favorite artist and my favorite comedian). And when I finally got there, I didn’t panic and I actually said those things (more or less). I told her I was an aspiring children’s novelist, too. She asked if I’d read any Anne Lamott, and when I joyfully said yes, she recommended Art & Fear by David Bayles and Ted Orland. 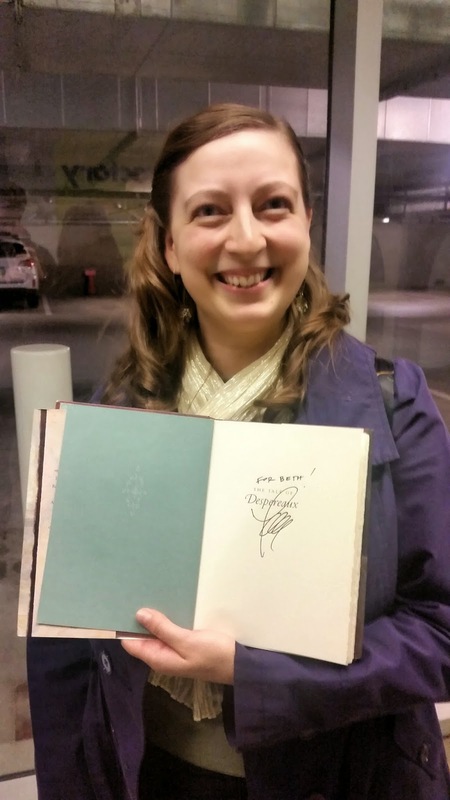 I got my picture taken with her, and I left walking on air, with a signed and personalized first edition of my favorite book ever and the inspiration that someday I will write a book that will be someone’s favorite book ever. Next > Spring ILC, Week 1: What the heck is an ILC?